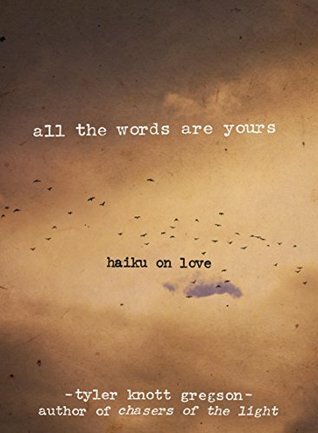 Earlier in the year I read a book of poetry called Chasers of the Light: Poems from the Typewriter Series by Tyler Knott Gregson, and shortly after I finished reading it I realized that he had another book out called All the Words Are Yours: Haiku on Love, which I immediately added to my reading list. I don’t read a lot of poetry, and I’ve never read haikus, but I immediately fell in love with this book. Because of the structure of the haiku each word in the poem is so incredibly important, and thus also packs a punch when you read. These haikus were lovely, funny, sad, and just truly inspiring. I found myself flipping back to read some again and again. Overall this was a fantastic read, and a book that I would recommend to anyone who needs a little more love in their lives – which quite frankly is probably everyone. I don’t read very much poetry, but I stumbled across this book and I fell in love with the title “Chasers of the Light” so I picked it up, and after a quick perusal bought it. 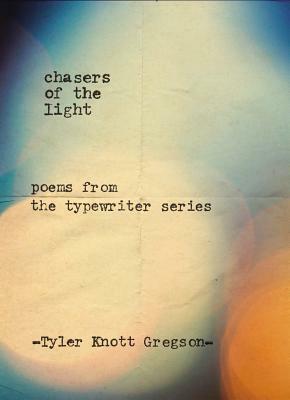 Chasers of the Light: Poems from the Typewriter Series by Tyler Knott Gregson is a book of poetry about love, and life. I love that the poems are photographed because they’re typed on the back of random pieces of paper. It gives the book a slight coffee table book kind of air because the printed pages are glossy, but it also has this uniqueness about it because the poems are typed. I like the dichotomy. The poems themselves are beautiful. They’re usually rather short, but they pack a punch. They’re also usually very uplifting, which is always lovely. Sometimes I feel like poetry gets a bad rap for being either very niche, weird, depressing etc. And these are not. They are accessible, and charming, and remind you of the beauty in the world. It’s very refreshing. I read this book before I went to sleep. I would read a couple of poems until my eyes started to close and then turn out my light. It was a wonderful way to get your mind and heart into a good headspace before you fell asleep. I would highly recommend this book for lovers of poetry, and for those out there who don’t like poetry all that much. I think that everyone would really like this one. I’m also going to be on the lookout for any other books that Tyler Knott Gregson does. He’s definitely one to watch.